We have scoured the internet to find some absolute bargain adidas kids boots for under £50. 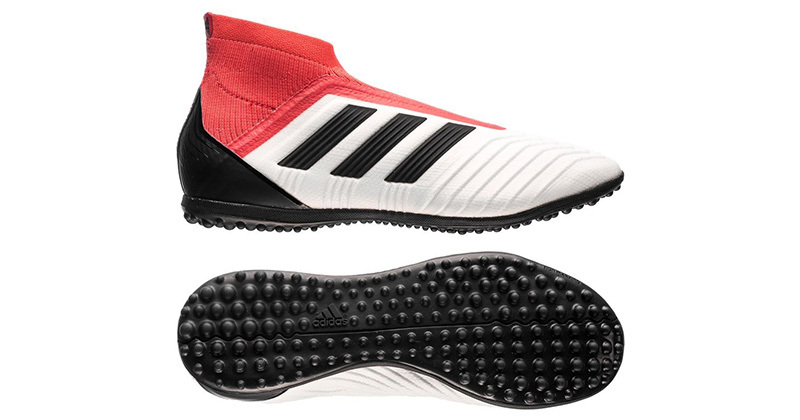 adidas football boots have always been popular with kids and that shows no signs of changing. 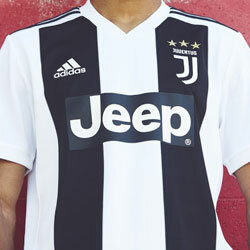 adidas offer a range of different tiers of boots, from the equivalent of those worn on the pitch by professional players, down to a basic boot with minimal technology. 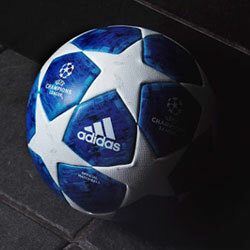 We have scoured the internet to seek out the best 8 prices on high-end kids adidas boots for bargain prices. Your kids will be the talk of the pitch with their top end boots and you can feel smug at bagging an absolute bargain compared to the RRP. So here's our top list of bargain high-end kids adidas boots for less than £50, counting down from 8 to 1. Not only are these top end, but they are GOLD. A winner with any child under 10 years old. OK, so most adults over 30 wouldn't want to wear gold boots, but when you're 8, gold is the colour to be seen in. 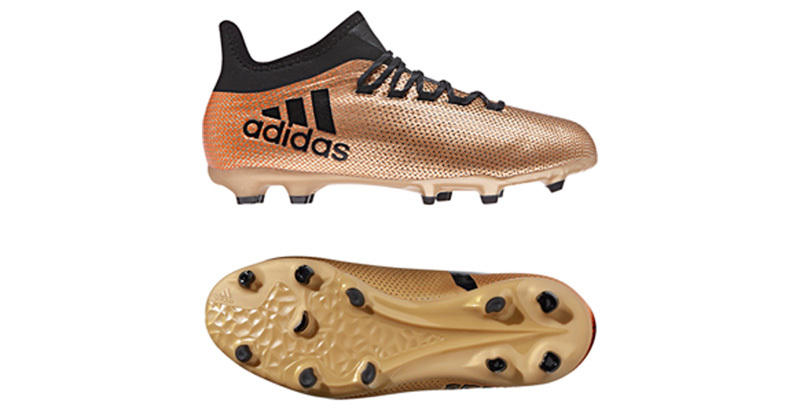 These adidas X 17.1 kids boots have a firm ground soleplate so are perfect for use on grass pitches that aren't too muddy. The 17.1 is a pro boot with an integrated sock so your kid will be comfortable and well-supported. Available in sizes 1-5.5 and on offer for just £44.46 at the time of writing, these are a high-end bargain of a boot that will definitely get the thumbs up from your kid for the new season. Snap these up before they go because they won't hang around at this price. Indoor boots can be worn for both playing indoors and instead of trainers for day to day wear due the lack of studs on the soleplate. 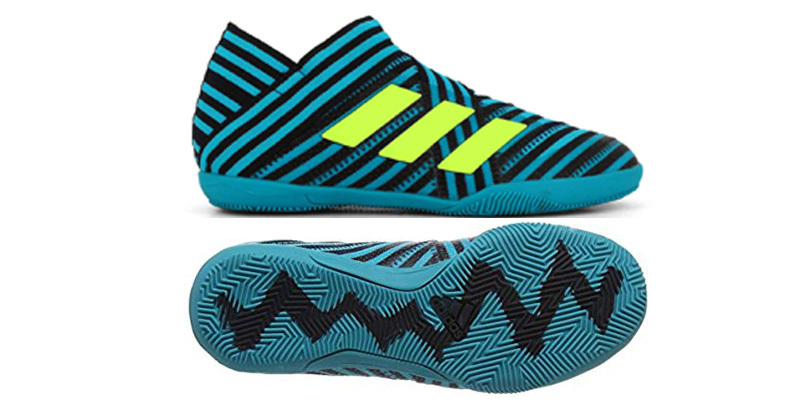 At just £39.99 at the time of writing, these Nemeziz 17+ indoor boots are cheaper than most trainers and are the most technically advanced of adidas' indoor boot lines. 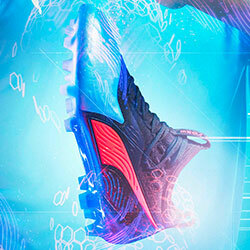 The flexible sole offers total comfort and great traction for the indoor player. An absolute bargain that won't hang around for long. Top end Messi boots at a bargain price, what more could you want? The demand for Messi football boots among kids is understandably high, who wouldn't want to copy the Greatest of All Time? These high end Nemeziz Messi boots are the same ones worn by Lionel himself and will be a definite winner with any Barcelona fan. Designed for use on firm ground grass pitches, these are boots offer total foot support due to the bandage style construction. Priced at just £44.99 at the time of writing, these are massively reduced and worth grabbing before the price increases. Player standard astroturf boots from just £39.99. These junior adidas Ace 17+ boots are player standard and priced at just £39.99 they are hard to beat. 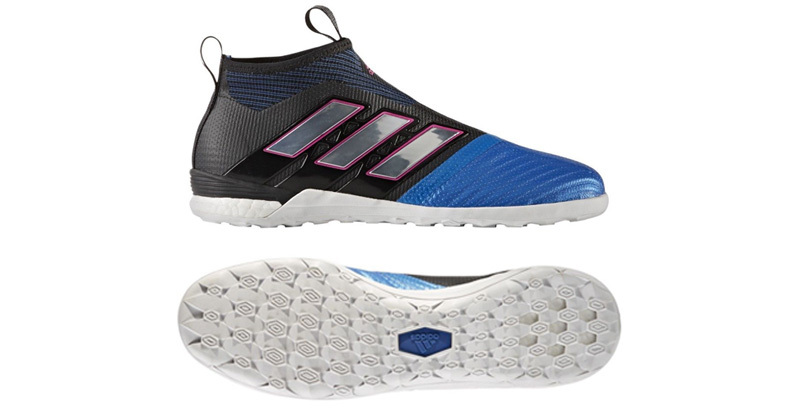 If your child plays on water or sand based astroturf, these are a great boot with just enough grip to cope with a turf pitch and strong enough not to be wrecked by this tough surface type. These are available in sizes 10.5-1, so perfect for younger players who will benefit from the comfort and support these will offer. These junior adidas X 16.1 are the oldest boots in our list, but what a deal. Priced at just £24.99 at the time of writing, this is a huge discount on the RRP. In a slick black colourway, these are classically styled and full of features. Designed for use on a firm pitch, they have an integrated collar for ankle support. 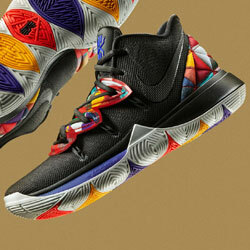 Available in sizes 10.5-5 but limited sizes at the cheapest price. 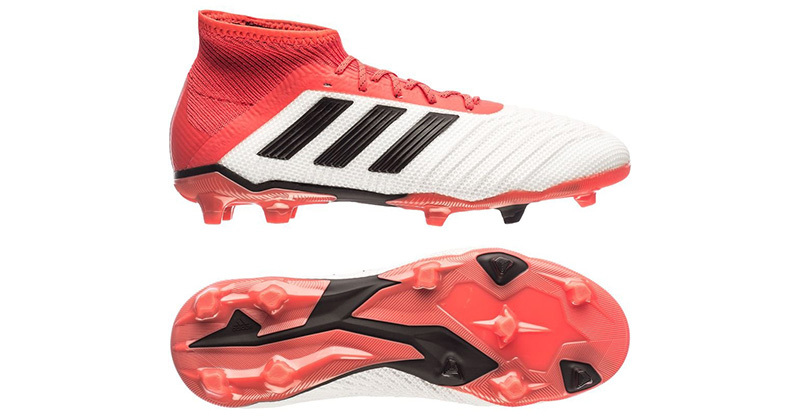 The latest player-level laceless Predator for just £37.39. 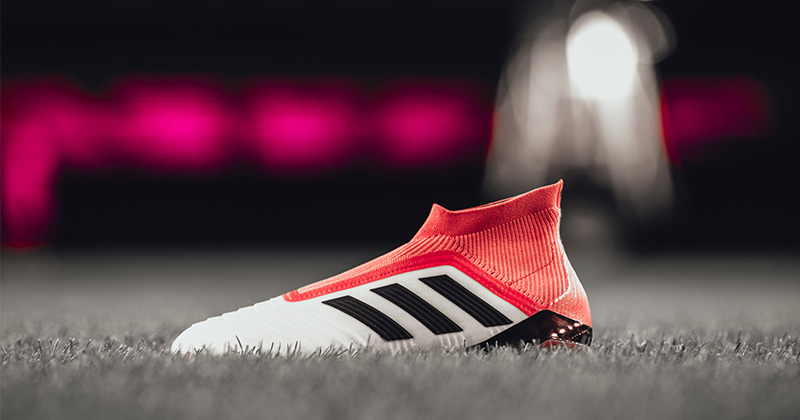 These junior adidas Predator Tango 18+ turf boots are this season's colourway that are still being worn on the pitch by the likes of Paul Pogba. Designed for use on astroturf pitches, these boots have added grip from the raised rubber mouldings which is the key difference from an indoor boot. The boots are laceless making them perfect for kids who struggle with their laces. 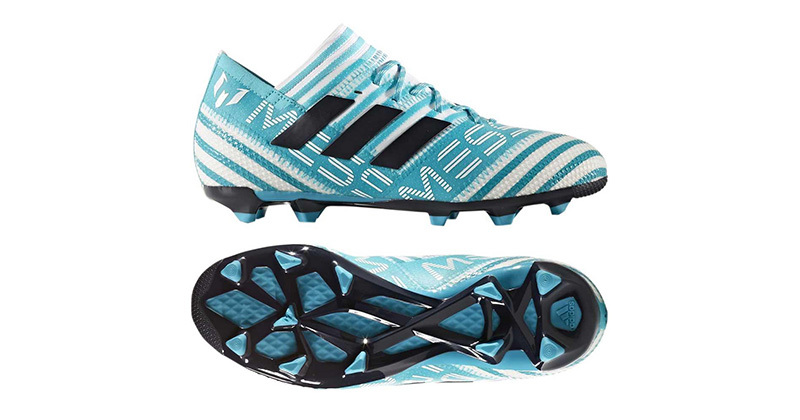 Current Messi boots for just £45. Messi boots are ever-popular for kids and a current season pair of firm ground Messi boots would be a definite winner for most football loving kids. At a massively reduced £45 at the time of writing, these boots are highly technical and offer support and comfort beyond that price tag. 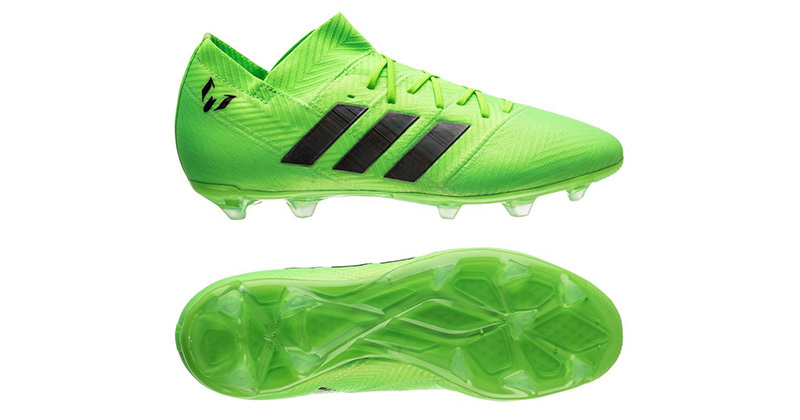 This bright colourway will make a major impact on the field and the firm ground soleplate make them perfect for playing on well-maintained grass pitches. Our best-buy junior boot, what a bargain at just £35.55. 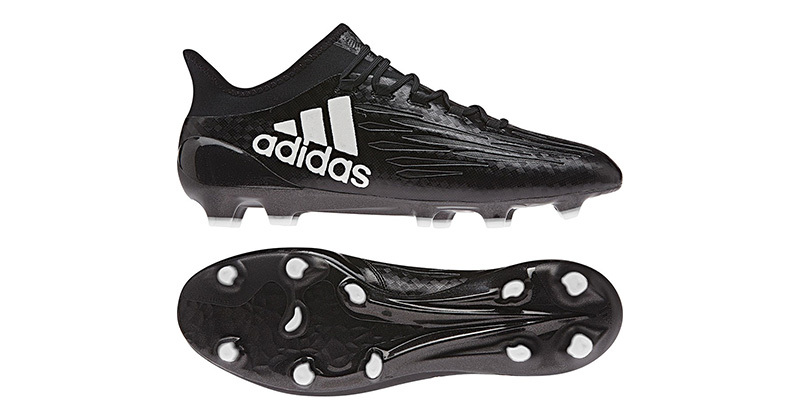 Bagging first place in our list, the adidas Predator 18.1 FG is just £35.55 at the time of writing. These lace-up boots offer a highly technical spec and look just as good. Designed for firm ground grass pitches, this is adidas' most popular soleplate and the Predator is the most popular adidas boot of all time. Grab yourself a bargain, these will be gone before you know it. For an even greater selection of kids adidas boots at bargain prices, you can browse our full range under £30 or under £50. 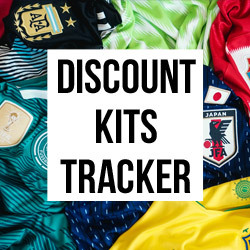 We compare prices on all football boots from all brands so you can rest assured that you're getting the cheapest prices anywhere online.